The Foundation has recovered 18,281 tons of textile used in Spain in 2017, 1.6% more than the previous year (17,983 tons), confirming the loyalty of the citizen towards a model of management of textile waste with social purpose (in 2015 that figure it stood at 16,853 tons). Humana has 5,190 containers in Spain under the agreements it has with more than 2,000 municipalities and private entities. Citizens deposit clothes, footwear, accessories and home textiles that they no longer use and to which the organization gives a second life. The textile collection service is free and represents a significant saving in the costs of collection and disposal of urban solid waste. The objective of the Foundation is that the selective collection of used clothing and its preparation for reuse are consolidated as a fundamental part of waste management. 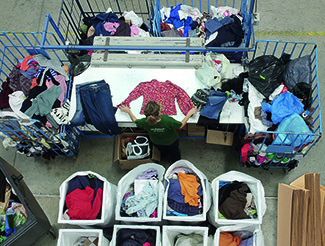 Elisabeth Molnar, Humana General Director, considers that the increase in selective collection responds to several causes: "First of all, there is more and more interest on the part of the citizens and administrations to reduce the amount of waste and lengthen life of those garments that are in good condition. Through the recovery of used clothing, we manage to reduce the volume of improper products that end up in other fractions, as well as enabling the reuse and recovery of raw materials. We do this to provide these resources with a social purpose, since the garments that are discarded are an asset that, properly managed, becomes the engine of progress in Spain and a generator of funds for development cooperation in the Southern Hemisphere". "Second," she adds, "as specialists in preparation for reuse, we manage the donations of clothing and footwear used to obtain the maximum use of textile waste, giving it a second life and thus favoring a circular economy model. Thus, we convert waste into resources so that they can be used again and again, and contribute to an economically and socially sustainable society ". The reuse and recycling of textiles contribute to saving resources, protecting the environment and fighting against climate change. It reduces waste in controlled deposits and in incineration plants, as well as the emission of greenhouse gases. Each kilo of clothing that is reused and not incinerated avoids the emission of 3.169 kg of CO2, according to data from the European Commission. The 18,281 tons collected in Spain in 2017 represent a saving of 57,934 tons of CO2 to the atmosphere. They are equivalent to the annual emission of 21,760 cars (which circulate 15,000 km per year) or to the annual absorption of carbon dioxide of 432,349 trees. 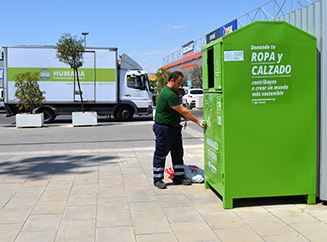 On the other hand, textile waste management brings two great social benefits: the first is the creation of green jobs and the contribution to the social economy, since it fosters the creation of inclusive, stable and quality jobs: Humana has a growth template thanks to the fact that it generates an indefinite job for every 36,000 kg of textile collected. The second is the contribution of resources to development cooperation projects. After three decades of activity, 2.4 million people have been involved in the development projects that Humana carries out in the countries of the South hand in hand with its local partners. The organization has allocated more than 30 million euros for the training of primary school teachers, the promotion of sustainable agriculture based on the strengthening of the capacities of small farmers or the programs to fight HIV / AIDS, among other actions of development.